I just bought this book and never expected to read it so early to my 2 y.o+ boy. Not only he has some new books to read, I was doubted if he could handle it (which content is longer and deeper; in fact, Room on the broom is harder than this one). Just few nights after the arrival of new books (include this one), he saw the 'penguin' on the cover and therefore he took this book from the book shelf. Well, I or his daddy has to read the book since he's given the right to choose book to read from our mini home library. Mrs Montessori is right on her saying 'a child's brain is like a sponge". At younger age, a little brain can absorb any sorts of information at ease and pace... never be contented. So we read the full story to him whenever he brings this book to us. One night after a shower, I walked out from the bathroom while my boy just finished his bedtime story (of this book) with daddy. He came to me with arms open wide and said. My boy: Mommy, hug me, like penguin"
Me: Like penguin? Penguin hugged who? My boy: Penguin hugged boy. From that night, I changed my review about this book. It fits for younger children. Just read it and share the things you see ... the feelings you feel from the book. 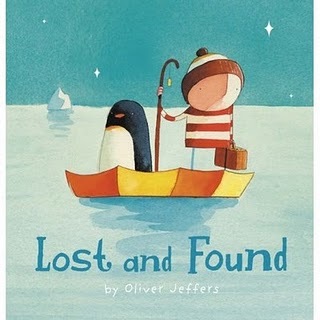 Like the big ship, the south pole (where penguins live), the boat... and the words like lost, found, sad, happy and hug. Whenever we finish reading this book, we give each other a hug.